Patients who receive anaesthesia for surgery may wake up jet lagged – after a six hour operation that starts at 9am, for example, a New Zealand patient might wake up on Sydney time. This could leave patients with trouble sleeping, inhibit wound healing and lower immune function. In a bid to investigate this and find possible treatment strategies, the University of Auckland’s Dr Guy Warman first used a Marsden Fund grant to look at honey bees, and is now running a clinical trial to see whether light-producing masks can help reduce the biological clock’s disruption associated with anaesthesia and surgery. Next week he’s giving the first in a series of lectures around New Zealand in recognition of the International Year of Light. In his Ten by Ten Luminaries talk he will explain the importance of light for our biological clocks and how light may provide a tool to help improve sleep following surgery. How does anaesthesia cause jet lag? It is a strange phenomenon that patients wake up and think no time has passed. What we found in our honey bee work was that giving bees anaesthesia during the day shifted their biological clocks at the fundamental level of gene expression. Interestingly this effect did not occur when bees were anaesthetised at night. The really exciting thing was that if we gave the bees light at same time as the anaesthetic it stopped the shifting effect. Since doing surgery at night just isn’t realistic, if humans behave the same way as bees, light therapy during anaesthesia may give us a way to help patients. Why did you use honey bees? In our Marsden funded project our team chose to work on honey bees because of their extremely accurate “time sense”. Honey bees use the position of the sun in the sky to find food sources. The sun, of course, appears to move across the sky over the course of the day as the earth rotates. The bee’s “time sense” enables them to know where the sun should be in the sky at any time of the day or night. We used this “time sense” as a marker of what time of the day bees “think it is” after a period of anaesthesia. By tracking bee flights using a harmonic radar my colleagues Dr Cheeseman, Dr Millar and I were able to show that when they emerge from a six hour anaesthetic their perception of the passage of time has been halted. Further, we were able to show that this was due to the anaesthetic acting on the expression of genes that control their circadian clock. Are you still working with bees? Yes, we are still working with bees but we have broadened our research to include other organisms. We are doing work with fruit flies and mammalian models and are also conducting a clinical trial in the hospital. The animal model work enables us to gain an insight into the mechanisms underlying the effect of anaesthesia on the circadian clock, and the clinical trial will provide insight into the real-world effects of anaesthesia on human sleep and biological rhythms and how light may be useful in counteracting the disruptive effects of anaesthesia on our clocks. How could light effect the disruptive effects of anaesthesia in humans? If the opposing effects of anaesthesia and light on the circadian clock that we see in bees is similar in humans then exposure to light during an anaesthetic may result in a reduction in the disruptive effects of anaesthesia on the clock. This might result in a improvement in sleep post-operatively and potentially even expedite recovery. How are the clinical trials going? We have been carrying out clinical trials for some time now investigating the disruptive effects of anaesthesia on the human clock. But it has been difficult as most people who are having anaesthesia and surgery are doing so because they are ill and illness often causes sleep and clock disruption itself. Thus it becomes difficult to examine the effects of anaesthesia and surgery alone on sleep and the clock. However, together with a renal transplant surgeon and collaborator of ours in Wellington (Dr Andrew Kennedy-Smith) we came up with the idea of studying sleep and clock disruption in kidney donor patients. These are healthy people donating a kidney, so for our purpose, these people represent a really good population to study because they’re not confounded by an underlying disease state. 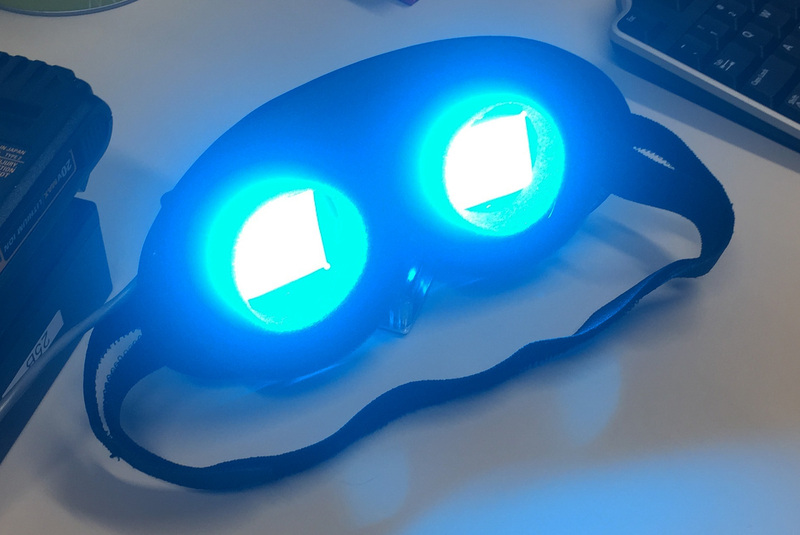 In this study we’re giving participants either light or “placebo light” during their surgery and examining their sleep and biological rhythms for a week either side of their surgery. We have a team of people including our PhD student Nicola Ludin currently working hard on our clinical trial and preliminary data show that patients’ sleep and circadian rhythms are disrupted following surgery. The study is still in progress, however, so it’s too early to tell whether light does reduce sleep and circadian disruption in these patients. In our honey bee work the effect can last for up to a week. The Ten by Ten: Luminaries series of talks, in recognition of the International Year of Light, involves ten talks by New Zealand speakers on different facets of light. Talks will be given in Auckland, Hamilton, Napier, Rotorua, Palmerston North, Wellington, Nelson, Christchurch, Wanaka and Dunedin. Thus it’s possible to find a light treatment for jet lag caused insomnia and other health problems.